Translated by Daniele and Pierre Bondil, this Rivages/Noir French paperback edition of Dance Hall of the Dead is a small format, elegant exposure to the American Southwest. 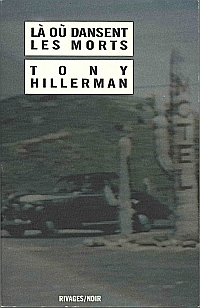 The cover illustration is a soft focus, tinted reproduction of a vintage photograph of a Sonoran desert motel in Southern Arizona. Despite the cover photograph's lack of relevance to the novel's plot, this edition works to solidly ground the French reader on the Zuni reservation by providing a detailed regional map, author's and translators' notes, and a comprehensive glossary. Format: Paperback, 17 x 11 cm. Binding: Paperback with full color front cover.